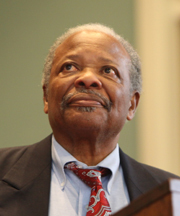 Referring to himself as a “foot soldier for freedom,” Charles McLaurin described his work in Mississippi’s Freedom Summer of 1964 to a large crowd in the Pioneer Chapel. McLaurin’s Chapel Talk kicked off the College’s celebration of Martin Luther King, Jr.
“The black freedom struggle in Mississippi was rescued by over 1,000 young people from the north,” said McLaurin, who joined the Student Nonviolent Coordinating Committee (SNCC or “Snick”) as a 19 year-old. McLaurin and his long-time friend Tracy Sugarman were invited to Wabash by the advisory board of the Malcolm X Institute of Black Studies to celebrate the legacy of Dr. Martin Luther King, Jr. 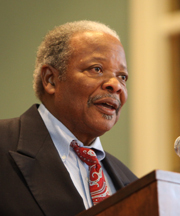 In his Chapel Talk, McLaurin gave students on a brief history of Mississippi’s fight for freedom, which he said began in earnest in 1961 when field secretaries from the NAACP were dispatched across the state. The odds were stacked against them. There were poll taxes that had to be paid two years in advance, literacy tests to pass, and local government officials and police were standing in the way. “There wasn’t anyone in any official capacity in Washington or any other place who would give us the time of day,” he said. By 1964, the earliest SNCC members were growing tired. That’s when more than 1,000 college students from the north — including at least three from Wabash — descended on Oxford for training before being dispatched across the state. McLaurin was part of a mostly black delegation that attended the Democratic National Convention to try to unseat the segregated delegation. During that period, the former sharecropper, Fannie Lou Hamer, became the voice of a generation fighting racial injustice. Listen to McLaurin’s complete Chapel Talk below or by accessing the College’s YouTube channel.